Have you ever heard about Clean My Mac 3? Should you buy it and use to clean up your Mac? 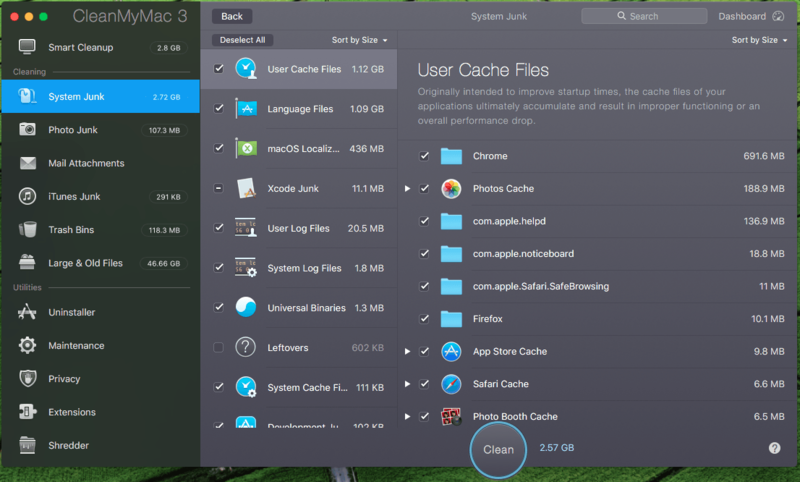 Well, you will find out soon enough after reading this Clean My Mac 3 review – from me. The story is I’m using a MacBook Pro 15-inch Mid 2010 and still don’t have any plans to upgrade to a higher model. Last month, when I turn my Mac on, there was a warning appeared on my screen. It said: Your startup disk is full, and suggested me to delete some files to make more space available on the disk. At that moment, I ignored the warning and keep using my Mac as I often do. However, it seems my Mac ran slower than before. There was a bit of delay when I open a new application. It was not open immediately as it often. Instead, when I click on an app to use, it only opens after five seconds. I thought this delay might be related to the previous warning that told me my startup disk was full. I did some searches on Google and asked a few experts about this issue. The answers I got from both places confirmed what I thought. Therefore, if I want my Mac back to normal, I have to remove some files and make more storage space on my startup disk. What Is Clean My Mac 3? Alize, one of my friends, told me if I want to fix this issue, as well as clean up my disk, I have to download & install Clean My Mac 3. Then use this cleanup app to do so. She said it is a good and must-have app for Mac OS, which helps me to clean up my Mac from temporary files, duplicate files, or large files that taken a lot of storage spaces – as well as maintain the best performance for Mac computer. I don’t know whether she exaggerates, but there is nothing to lose by trying the app. I have downloaded Clean My Mac 3 and installed it on my Mac to try. It didn’t ask me to buy a license in order to use. However, it seems without a premium license you only can remove up to 500MB of files. I ran a test. The app found around 3GB of temporary files that I could remove to gain more storage space on my startup disk. It also showed around 50GB of large files, which I could remove or move to an external hard drive to have more storage space. How Much Does Clean My Mac 3 Cost? Because I was using a free version of Clean My Mac 3, I only could remove 500MB of junk files, in the total of 3GB. In order to delete the rest, I need to purchase a premium license code, which costs $39.95. If you have friends, who also use Mac, convince them to buy Clean My Mac 3 with you and share the total of money. By that, the price for each Mac computer will be lower. 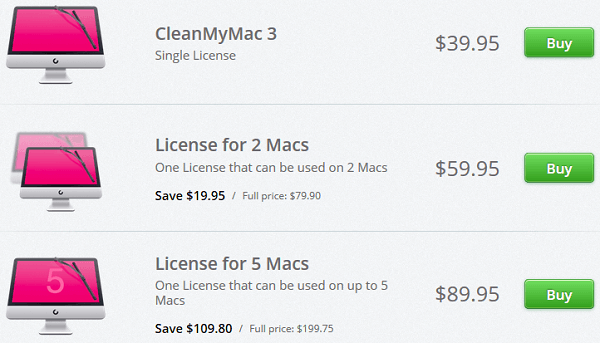 Currently, a single license of Clean My Mac 3 is selling for $39.95. 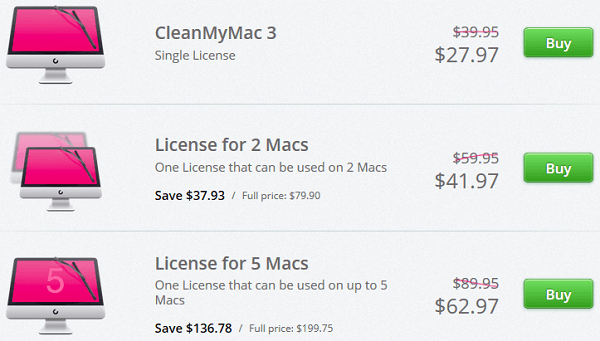 But if you buy a license for two Macs, it costs $59.95. That means you only need to spend $29.97 for each Mac computer. It will also be cheaper if you purchase a license for five Macs. When dividing, each Mac will only need $17.99 to use Clean My Mac 3. So, it would be more affordable for using this helpful app with group-buy. If you have used any apps from MacPaw before, just enter your email to confirm that you are an existing customer, you will have a better price. 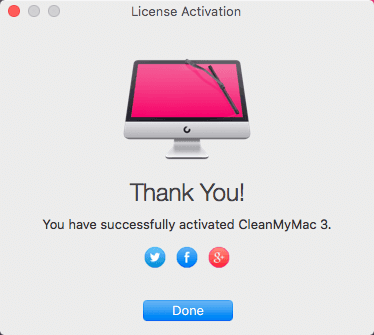 That’s the reason I ask my friend, Alize – to order one more premium license of Clean My Mac 3 for me. So I only need to pay $27.97 – after discounting. Overall, Clean My Mac 3 is a good Mac app that helped me to clean up junk files, as well as analyze my Mac to find large files to delete. Its user interface is very easy to use. You only need to download, install and then hit the Scan button. It will automatically scan system junk files, photo junk files, email attachments, iTunes junk files, Trash Bins, as well as large & old files. Once the scan process completes, you can view the total of storage space you can have after cleaning up. You can also select which files you want to keep and which to remove. As for “large & old files” section, Clean My Mac 3 will show all large files on your disk, as well as the last time they were opened. You can browse folders and files to identify which one are necessary and need to keep, and which one you can remove. Then you can decide to delete those files or move them to an external hard drive. Uninstaller: View list of installed apps, and uninstall those apps with their junk files. Maintenance: Contains several tasks that you can use to maintain your Mac and increase the performance. Privacy: It helps to remove browsing history, along with traces of your online and offline activities to protect your privacy. Extensions: Manage and remove extensions of your Mac apps, such as Google Chrome or Mozilla Firefox. Shredder: It allows you to delete unwanted files or sensitive data quickly and without leaving a trace. Note: Because I can’t add all images of these features here, please view all images in this Flickr’s album. Clean My Mac 3 also has a feature called Dashboard, where you can see basic details of your Mac, including hard drive, RAM, battery, and processor. 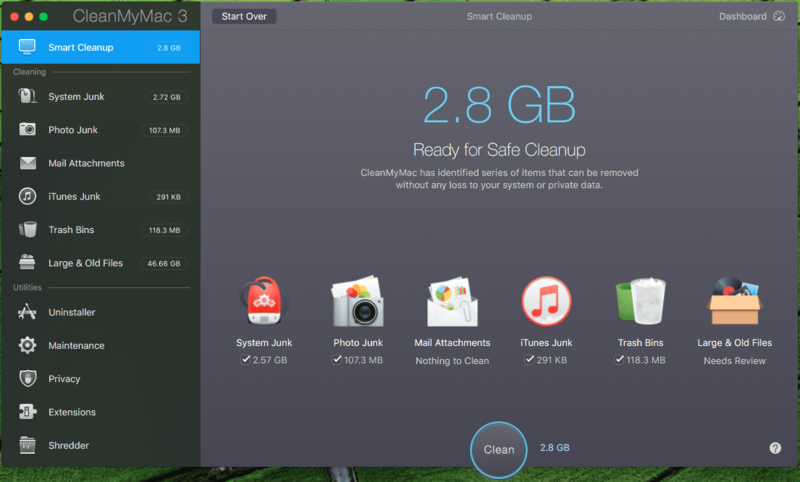 How To Use Clean My Mac 3 To Clean Up Your Mac? Download Clean My Mac 3 by clicking on the download button below and install it on your Mac computer. 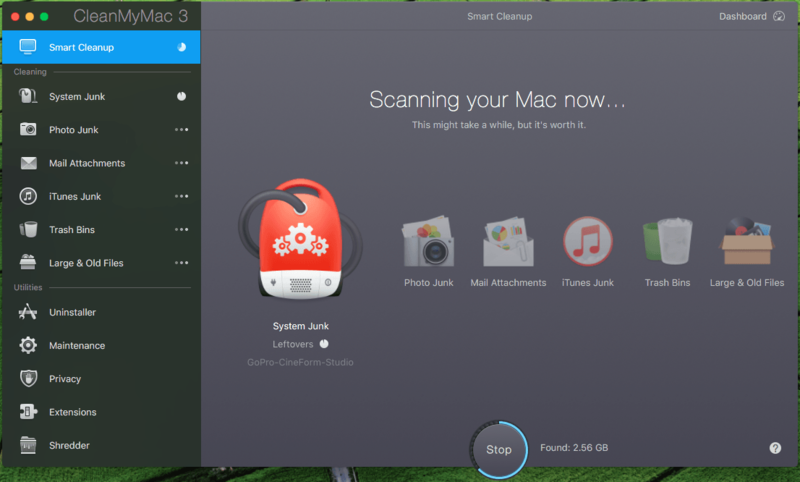 Hit Scan button to allow Clean My Mac 3 scan your system. Select junk files you want to delete, as well as files you want to keep. Hit Clean button to remove all selected files. Select large files you want to remove, and files you can move to external hard drive. Then move or delete those chosen files. You can also use utilities of Clean My Mac 3 to increase the performance of your Mac and speed it up. I have never used any other cleanup apps. Clean My Mac 3 is the only app I have ever used. From my point of view, this cleanup app is great and a must-have application on your Mac. It helped me to scan and remove all junk files once a week (manually). Also, Clean My Mac 3 is analyzed my Mac hard drive and show large files. From the results, it is very easy to decide which files I should remove, or move to external hard drive to free up storage space. If you ask me “Should I purchase and use Clean My Mac 3?“, I would say “YOU SHOULD“. You may be wondering whether I’m promoting for Clean My Mac 3. In fact, I’m doing it right now in this article. I may earn commission for each order you made. However, it can’t change the fact that Clean My Mac 3 is doing its job very well. It works efficiently to gain what you were expecting. This cleanup app will remove all junk files from your Mac computer and will free up some storage spaces. Also, MacPaw is offering you a chance to get a full refund within 30 days if you aren’t satisfied with this app.